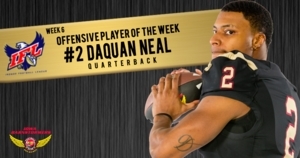 DES MOINES - Iowa Barnstormers quarterback Daquan Neal was named the Indoor Football League’s Offensive Player of the Week for Week 6, the League announced today. Neal (6'2, 215, Elizabeth City State) earned IFL Offensive Player of the Week Honors after leading the Barnstormers in a victory over the Cedar Rapids River Kings in week 6. Neal was extremely efficient in the passing game completing 14 of 17 passes for 124 yards and one touchdown. He also paced the Barnstormers on the ground, rushing a team=high 12 times for 58 yards and three touchdowns. Neal leads the IFL in completion percentage at 80.3 percent. He is also third in the IFL in passing touchdowns with 14. The Indoor Football League awarded defensive back Davontae Merriweather of the Arizona Rattlers with Defensive Player of the Week, while kicker Diego Marquez of the Tucson Sugar Skulls earned Special Teams Player of the Week. Neal and the Barnstormers return to Wells Fargo Arena this Saturday, April 6 for a rematch against the Cedar Rapids River Kings. Kickoff is scheduled for 7:05 p.m. The Iowa Barnstormers are hosting their Annual 90’s Night! Fans are encouraged to dress to the theme as the team plays 90’s tunes all night long. Fans in their best 90’s attire will be randomly selected to win prizes throughout the night! Don’t miss a minute of the action! Contact the Iowa Barnstormers front office for tickets 515-633-2255.